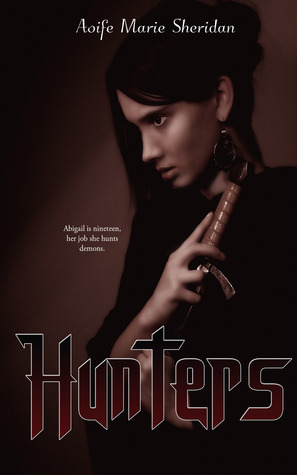 Abigail is nineteen, her job she hunts demons. Her life so far has been tough, having witnessed her family’s death and her mother’s suicide she’s taken in by a priest, who believes her when she says she sees ghosts. Father Peter trains her as a demon hunter with three other members, one being Daniel, who isn’t what he seems. But when a possession goes wrong, and ghosts start to attack Abigail, the tight rope she had on her emotions soon starts to loosen. Abigail draws the unwanted attention of the Vatican, and she finds out a lot more then she was willing to learn. Knowledge is power, but for Abigail it’s her undoing, and the only thing keeping her together is Daniel. “Where is she?” I asked as I laid out my roll of equipment on a hall table; it was the only piece of furniture in the hall so it had to do. Taking a cross out of my pack, I poured holy water over it, splashing some on the hall table and the carpet. A small price to pay for us saving his daughter’s soul. Rolling the rest back up, I placed it back into my jacket and tucked the bible under my arm. “This way,” the man said looking ready to bolt but thought otherwise. He stood at the third door down the hallway. Zee placed his hand on the door, and then gave me a nod, letting me know that we had the right house. I moved towards the door, but before I turned the handle, I turned back to the man. I asked as Zee got himself ready. Father Peter didn’t give many details, he just needed me to get there as quick as possible. Tears filled the man’s eyes. “A week, maybe two.” At least, it didn’t have a long time to fester. I gave Zee a nod just as I turned the door handle and entered the darken room. Light hurts them so I switched it on and let it flood the space. It was a standard sized bedroom, nothing special about it. A wardrobe rested against one wall, it once had been white but with time, it had faded. My eyes moved to the locker that was pine. It was bare of any ornaments and sat tightly against the single bed that the girl lay on. Her body was partially naked and her long blonde hair was stuck to her neck with sweat, I couldn’t make out her features as her face was no longer human looking than the hands that rested on her swollen abdominal. I turned to the man to give him a piece of my mind for leaving such a small detail out, but he had bolted, leaving us here with his pregnant and possessed daughter. Words of another language and another time came out of the girl’s mouth, more than likely cursing us into the ground or into hell. Zee’s hands moved robotically, taking items out of his trench coat. He placed two small white candles on the window sill, but didn’t light them - they were a just in case. He stayed close to them, but leaned against the wall. He looked so large in the small room. “Do you want to do it or shall I?” I asked. I always gave him the option; he did most of the work, but I hated tiring him out. He gave me the once over, considering if I was strong enough. “You go ahead. I’ll observe,” he finally answered. Moving towards the girl caused the demon inside her to rev up, making the girl’s body move at all the wrong angles. And redeemed by the Precious Blood of the Divine Lamb. The sound of laughter made me stop. As the demon overtook the girl’s face completely. My heart rate elevated. Zee, quick to act, lit two candles, knowing what was to come as the light bulb brightened, casting a blinding light in the room before it exploded and small shards of glass flew across the room. I covered my face, protecting it from the onslaught of the flying glass. Small cuts across my hands stung and warm blood slid slowly across my fingers. I took my hands away, ignoring the pain. The flames from the small candles that Zee had lit danced across the room but gave little light. Not being able to see fully, always made a possession more frightening, no matter how many times I did it, it never got easier. “Aaabbbiiigggaaaiilll,” the demon hissed inside the girl, slowly stretching my name, but I heard it. My body responded, causing me to stumble back, never before had a demon or spirit spoke my name. I stood paralyzed. “Abigail,” this time it was Zee who called my name and I could hear the warning in his voice. I needed to continue. I sucked in a deep breath and wiped the blood from my hands onto my jeans. I started the prayer again, saying it faster, and louder. My voice trembled slightly. I felt shook up after hearing that thing say my name. The demon inside the girl roared to life and squirmed with a voracity that shook the bed savagely. The bed’s thin, wooden legs slammed into the carpet, the noise drowning out my words, but I didn’t stop, I couldn’t stop for fear of what might happen. I continued as a few pictures fell from the walls, their frames snapping with the impact and the glass shattering across our feet. The curtains billowed now from an unseen wind. The bed continued to move rapidly. And the large wardrobe shook violently. Its doors swinging open and closed, the sharp bang lifting my heart every time. Zee stood protecting the candles from the breeze that raced through the room, carrying the foul stench of an unwashed body. I spoke louder closing my eyes, forcing myself to stay focused, even against the activity in the room. I clung to the cross. As my grip tightened it caused my cuts to bleed, coating my hand once again. I could feel the cross slipping and soon my hand was empty. The slamming of the wardrobe doors was getting faster and louder. The bed hit the floor harder, the wood snapping against the strain, small splinters of wood breaking free, and scattering across the floor. Then everything ceased, silence fell upon the room, my breathing moved in and out of my nostrils, sounding so loud in the dead silence. “Dad?” The one word was filled with fear and confusion and had come from the young girl; her voice broke through my numbness and fear. I moved towards her slowly, looking at her face. She looked normal again, pale yet terrified, but normal. I smiled the best I could at her confused face, hoping to give her comfort. She met my eyes with big blue ones of her own, ones she must have inherited from her mother as her father had those muddy brown eyes, a ray of freckles covered her nose and cheeks making her look like she was only about sixteen. She was so young to be pregnant. She looked around the room for her father. I gave Zee a nod to go get him and he hesitated, looking at the girl for a moment. “It’s fine, Zee. She’s okay,” I assured him. He left hesitantly at my words. “What’s your name?” I asked, moving closer, trying to halt all the questions that I knew must be going around in her head right now. Once someone was possessed, they could never remember the ordeal. It was for the best or lots of people would never sleep again. “Lucy,” she said, still looking around the room that was only lit now by candle light. “Lucy, that’s a pretty name,” I said, she was looking at me as if I was crazy. “What are you doing in my room? And why is everything such a mess?” she asked, looking at all the frames and shattered glass on the carpet. A logical question, yet I had no logical explanation. “How far are you gone?” I asked, looking at her stomach, trying to distract her until her dad got there and he could come up with whatever story he wanted to. She looked down at her belly after hearing my question and her cheeks lit up when she realized she was half-undressed. Fear and confusion filled her face. “It’s okay, Lucy.” I didn’t get to finish as she started to scream while kicking her legs and pulling the remaining blankets off her, blood started to soak the sheets. “My baby!” she screamed as Zee and her dad entered the room. I rushed forward, grabbing the blanket; I needed to stop the bleeding, her stomach rippled and I had to blink twice to make sure I was seeing what I was seeing. A hand formed, pushing its way against her stomach, reaching out to me, stretching her skin almost to breaking point. I fell back off the bed, away from the hand, while pulling the blanket with me. The bed started to levitate. Lucy’s screams and her father’s pleas to save his daughter made the room swarm around me. “Abigail, Abigail,” the voice danced around me, I covered my ears. “No. No!” Zee’s feet rushed past me and he jumped up on the bed, fighting the hysterical flailing arms that Lucy threw around as her stomach stretched and moved at abnormal angles. The demon had attached itself to the child’s soul. I snapped out of my daze. The cross lay on the ground, its gold surface now tainted with my blood. I grabbed it and jumped up while holding onto the cross for dear life as Zee placed his hand on Lucy’s stomach, a gust of air ripped through the room, throwing everything into chaos. The candles hit the carpet and distinguished almost immediately, leaving us in darkness. I couldn’t move for a moment, but could only watch as light poured from Zee’s fingertips, blinding all of us. Sound ceased to exist at that moment, while everything around us continued to shake. I could feel the ground under my feet vibrate. Through the light, I could see Lucy was still alert, her mouth open as she screamed in fear and agony. Her eyes wild, the veins bulged in her neck as she continued to scream soundlessly. It was like watching a movie with the sound on mute. A large crack raced down the wall behind the bed, just stopping at the skirting board, and then the room went dark. The world stopped shaking. “Lucy, sweetheart, talk to me,” her father’s frightened whispers reached my ears. I opened my eyes as Zee came to me and his strong arms pulled me into a tight embrace. His smell, his warmth calmed me. His heartbeat pounded against my ear, bringing me back. I looked up at him. I nodded, but I was anything but okay. I pulled away and stood on trembling legs, making my way to the bedroom door. Once I opened it, light flittered into the room. I looked at Lucy, her body lay still. She looked snow white against the blood soaked sheets. “She’s alive,” he answered and left the room. I pushed the button and made the dreaded call. 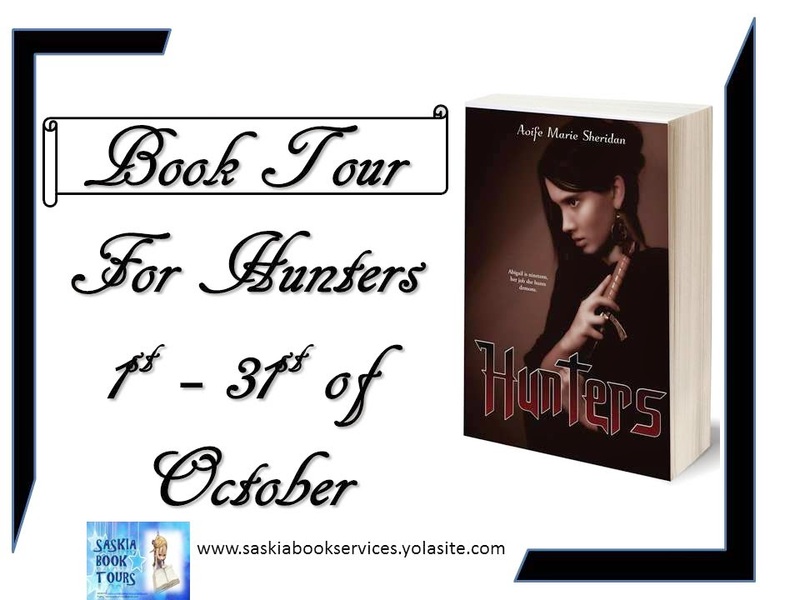 Recently I have published Hunters. Demon Series Part one. It will be released on the 1st of October. Well I work so I don’t have a lot of time to write. My writing goes something like this. If I have a spare moment – grab a pen, the house is empty – type. Quiet at work – get a notepad, ect. Just any moment I can find to write, I will. J But I never suffer with writer’s block, when I finally get to write I know exactly what I want to say. Question: What types of writing do you do? Mostly Paranormal/Fantasy but I would love to do a contemporary romance, maybe one day. I just love Cathy. She is part of Abigail’s group. Her story and background are very sad but it gives her a flair. Cathy can be nasty or overly self-confident but she does all this to hide her insecurities her full story comes to light in Book Two (Hunted). But she was fun to write. Secondly of course is Abigail. She was a very complex character to write. She’s an alcoholic so I had to do a bit of research on this. Also her trauma of seeing her family die has damaged her. She’s fuelled with anger, guilt and self-doubt constantly. We don’t see Abigail in a happy light until we reach Book two (Hunted). We see a more mellow side to her. Over all it was a challenge to write her, but I enjoyed it. I have a playlist for hunters. I listened to all these songs on repeat. I am not as bad as I use to be, so I don’t really eat, (THAT IS WHILE WRITING) J normally my downfall is caffeine. What is your favourite non-alcoholic drink? Coffee. What is your favourite cartoon character? I love the little girl from Despicable me. What is your favourite movie of all time? War of the Worlds. What TV shows do you like to watch? Games of Thrones. What do you like to do for fun or just to relax? Read, Watch movies or go out for meals. 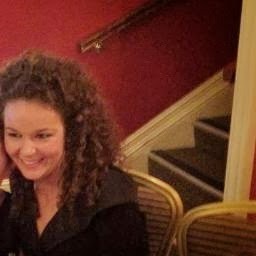 Aoife Marie Sheridan has loved reading from a very young age, starting off with mills and boon's books, given to by her grandmother her love for romances grew, by the age of 14 she had read hundreds of them. Aoife had a passion for writing poetry or in her eyes her journal entries. It was something she did throughout her teens and into her twenties. Aoife won first place for two of her poems and had them published at a young age of just nineteen. Realising she needed to get a real job (What writing isn't) she studied accountancy and qualified working in that field for many years, until her passion for reading returned and she found Maria V Snyder. Poison study one of her favourite books has been read and re-read countless times. Aoife's first book Eden Forest (Part one of the Saskia Trilogy) came to be after a dream of a man and woman on a black horse jumping through a wall of fire and the idea of Saskia was born. Now with her first novel published and taking first place for Eden Forest with Writers Got Talent 2013, Aoife continues to write tales of fantasy and is currently working on her third book for the Saskia Trilogy amongst other new works.